Niche landing pages are simply web pages where visitors are directed to whenever they click a result in a web search or whenever they click a web ad. For niche affiliate marketing, landing pages would refer to the web page where you, as a merchant, would want your potential customer to be directed after clicking your ad on your affiliate’s website. Niche landing pages is simply the first page that a visitor to a website sees. For most websites, the default landing page is a homepage from which most visitors start their stay on the site. However, savvy- brands who understand consumers like to be engaged with, also make sure to create landing pages that are either highly optimised to a specific type of visitor, or connected to a broader marketing campaign. Such landing pages frequently include calls for action so visitors complete a task. For instance, reminding them to take advantage of a special offer. Some online businessmen would even use the homepage of their websites as the landing page for their ads. Are these businessmen making a big mistake? Or should you follow their method in creating landing pages for their ads? Well, you can always follow what most online retailers do, directing their potential customers to the homepages of their niche websites. But if you want to achieve something more from your online business, and if you want to earn a lot of profits, you better create a special landing page for your web ads. Why? Here are a few reasons why you need to use landing pages for your web ads. And take note, it would do you a lot better if you create a great landing page than a so-so one. Reason no. 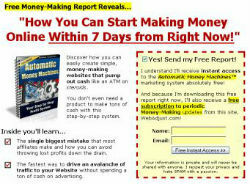 1: It is the only way you earn conversions in a niche affiliate marketing program. There are a variety of niche affiliate marketing programs today, but most of these programs let the merchant pay the affiliate in a pay per click basis. Basically, all you have to do is sign up with the program and submit your ad. The program owner would then distribute your ad to various affiliates who would then place your ad on their websites. Whenever your ad is clicked, a visitor would be directed to your landing page and you would have to pay the affiliate for his service. As a merchant, you earn in a niche affiliate program through conversions—that is whenever a visitor that is directed to your site actually buys a product on your site. Without these conversions, you actually earn nothing from the program. Also, the more visitors that your affiliates have directed to your site, the larger would your expense be. And the only way that you can recover from these expenses is through conversions. Now, you sure won`t get any conversion if you have posted an ad on your niche affiliate`s site without an actual landing page for the potential customer to be redirected into. It`s just like advertising a product without actually having a store to sell your product. It is therefore important to have landing pages for your ads because it is the only way for you to earn something in an affiliate program. Without landing pages, all you do is spend money paying your affiliates without actually getting anything in return. Reason no. 2: Other web pages may just not be enough. Many people make the mistake of making their website`s homepage as the niche landing page for their ads. The same is true for those who make use of other pages like a "contact us" page or a product page. Homepages are often designed to serve multiple users and contains a lot of links to other pages or to other websites. The same is with the other two pages mentioned. If you want to be successful in an niche affiliate program, we`re sure that you don`t want your landing page to cater to the needs of various people, most of which may not be really interested with your product. When choosing a niche landing page, you must always have the customer directed into that page in mind. Therefore, your landing page must be relevant to the keywords and the contents you placed on your ad. It is also important that the landing page can induce your visitor to take action—that is to purchase your product or at least provide leads for potential customers. You probably entered into a niche affiliate marketing program with these things in mind: to save on advertising expenses and to gain more profit. But if you get into a niche affiliate marketing program without actually having a landing page, you`ll end up paying too much without getting anything in return. So if you still don`t have a landing page for your ads, you better start creating one now. And don`t get us wrong; it isn`t enough for you to have just a landing page—it should be a great landing page.